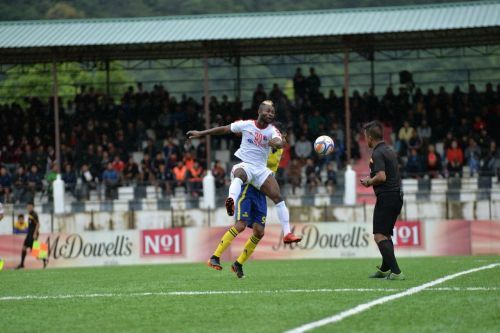 The Round 7 of the Mizoram Premier League Season 7 was played today at Serchhip where Aizawl FC and Mizoram Police FC bagged home solid points. Aizawl FC thumped Bethlehem Vengthlang 4-1 while Mizoram Police FC defeated newly-promoted side Chawnpui FC by 2-0. The Reds’ gaffer Gift Raikhan make way for newly-recruited Liberian forward Ansumana Kromah and the latter did not fall short of any expectations. The I-League side took the lead through promising winger F. Lalremsanga in the 9th minute and the young forward earned himself a penalty in the 43th minute, paving the way for 26-year-old Kromah to score on his debut for the club. Though Bethlehem Vengthlang pulled back a solitary goal through P.C. Vanlalhruaia during the hour mark, goals from the man of the match Lalrinfela (55’) and Lalkhawpuimawia (90+1’) sealed three points for the former champions. “Kromah was excellent. He was quick as ever and he made quite a few crucial pass for his teammates,” remarked Lal Zarzova, a sports journalist for daily newspaper Vanglaini. The second match witnessed Mizoram Police FC beating Chawnpui FC by two goals margin with goals from Eric Lalsangzuala and Malsawmfela. The day two of Round 7 will be played on 13 October, 2018 where Ramhlun North FC lock horns with the underdogs Electric Veng FC and former champions Chanmari FC going head to head with the current champions Chhinga Veng FC. Mizoram Premier League since its inception in the year 2012 have made fruitful results through the years and matches have been played ‘away’ from Aizawl since Season 5. The Round 7 of Season 5 was played at Champhai, Round 7 of Season 6 at Lunglei and Round 7 of the ongoing season at Serchhip, which is approximately 110 kms from the capital city Aizawl. Aizawl FC’s I-League Title winning Team- Where Are 13 of the Key Players Now? I-League 2018/19: Can new coach Stanley Rosario turn around a sinking Aizawl FC? Race to ISL crown vs Race to I-League title: Which is more exciting?